Casino games are big business in the mobile world. According to App Annie: casino games make up 6 out of the top 20 highest grossing games. 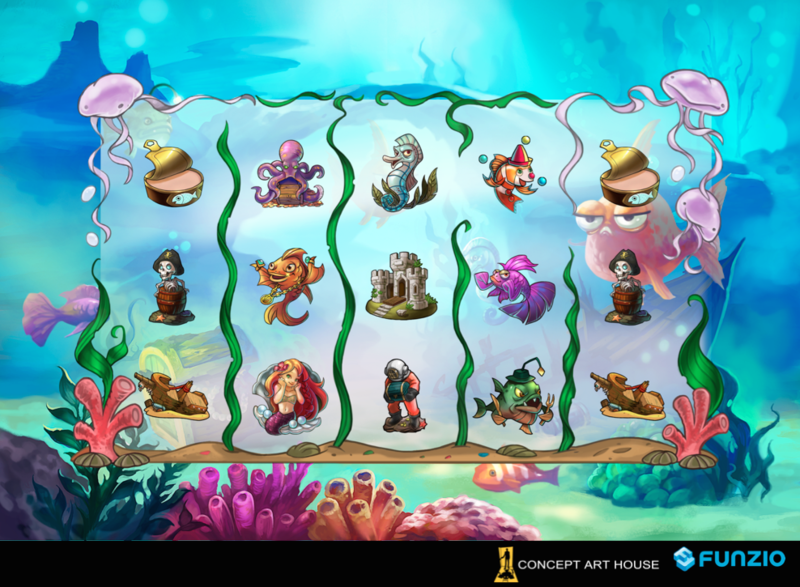 Concept Art House has worked extensively on casino game projects with clients like Big Fish and Konami -- providing marketing art and in-game assets. In this blog post, we share best practices for creating dynamic art for casino games. Eye-catching, big, bold and luxurious assets are king. Above all, casino developers want their games to look premium and appealing. Many characters are designed to be characters and symbols in the games and slots. Graphic design is essential. Art assets are married with text to clearly draw in new users. Most symbols, characters and backgrounds are animated in order to catch they eye of players. Developers must take this into consideration when designing assets for casino games and slots. Casino art is often high resolution to be easily visible and attractive on mobile and life-size game machines. All the art must look good standing alone as well as paired with other assets in-game. Most of the art has a hierarchy of value that must read immediately. Senior Account Executive, Debra Kaplan, has worked extensively with casino clients and shares some insight on comparing casino game art styles to the art styles of other top-grossing mobile games. "For casino games, the entire goal is to hook and keep players. They want to keep you coming back again and again to play the game. Casino game developers are masters at using flashy images, sparkly video effects, and bold colors to make players feel engaged. Games like Candy Crush and Clash of Clans have done a great job emulating this engagement -- drawing inspiration from the art styles of casino games. But the Casino industry will always be the best and boldest at using art animation and effects to keep players playing." Take a look at some examples below from our portfolio. Big Fish reigns supreme in terms of casino mobile gaming. Big Fish Casino is the top-grossing casino game in the US mobile market -- earning about $50 million in revenue in Q2 2015. Concept Art House provided marketing images for Big Fish Casino in the past. In the marketing images below, casino game art's iconic flashy effects and eye-catching designs are prevalent. Playstudio's MyVegas series is the only casino game that gives you free rewards from top Las Vegas resorts like Bellagio, Aria, MGM Grand, and the Mirage. 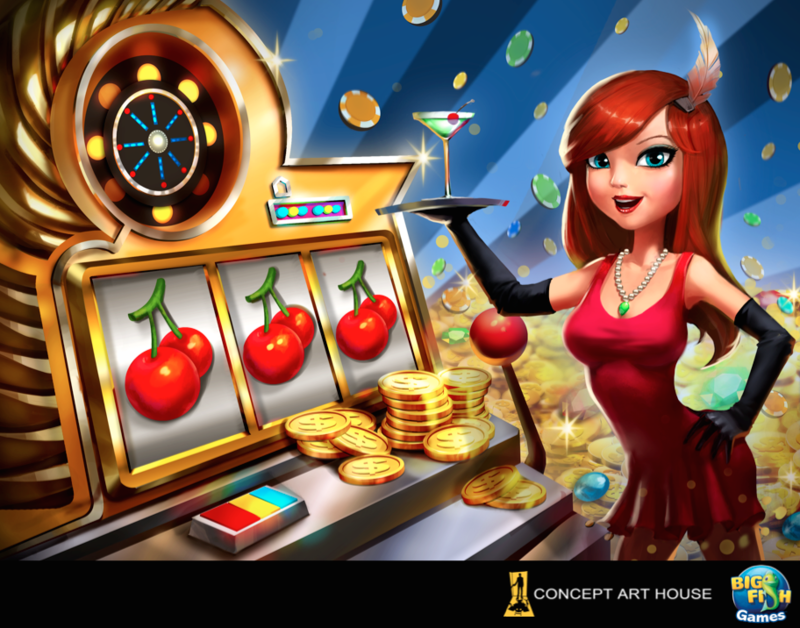 Concept Art House has worked extensively with Playstudios to create in-game assets for MyVegas. 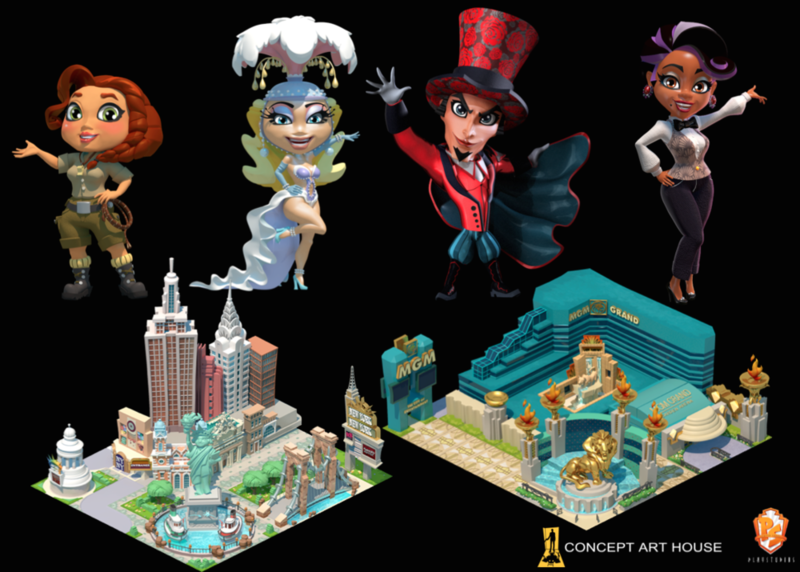 In the assets below, famous Las Vegas buildings like the MGM Grand are portrayed in a new, clean way with stylized, iconic Las Vegas characters. One of the most critical aspects of casino gaming is the art for the slots. Slots Bash is the new slots game from the creators of Bingo Bash. Below you can see example art from their slots screens. Assets look good together as well as on their own. Characters are also symbols. 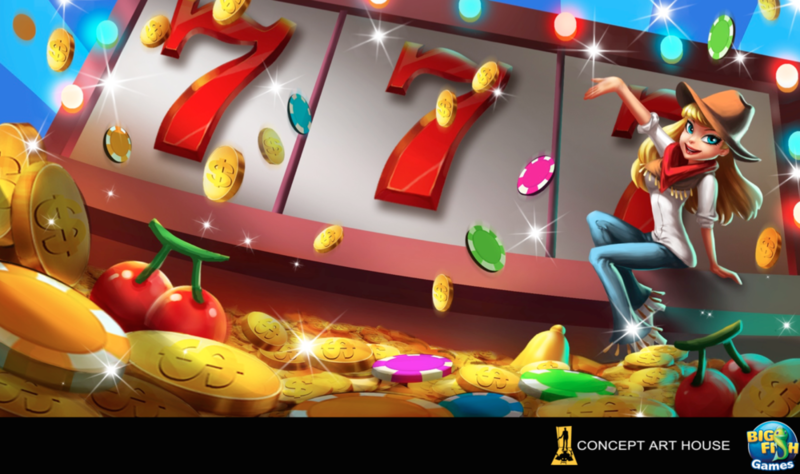 Need help with art for your casino games project? Don't hesitate to reach out for more information about our rates and services! Newer PostGoing to G2E, MLG World Finals, or Gamesbeat? Give us a call! Older PostUltimate Art From Reliance Game's Ultimate Robot Fighting.